On November 21, 1896, the Fort Erie Jockey Club set the wheels in motion for thoroughbred racing at the border oval, with President John Hood breaking ground. This is one of the actual invitations sent out in 1896, asking selected guests to attend the Ground Breaking Ceremonies for the construction of the Fort Erie Race Track. Wednesday, June 16, 1897. A beautiful day for racing, as Fort Erie Race Track runs its inaugural races. The dream had become a reality. The first race at the "Fort" was won by Ellesmere, guided home by a jockey named Sullivan. The placing judge ruled that Wordsworth grabbed second, with Miss Lillian in third. The winner of that initial race received $300 while second and third were awarded $75 and $25 respectively. As racing took hold at Fort Erie in 1897, the border oval sported summer and autumn meets. For 34 days, thoroughbreds danced down the stretch under the summer sun, then a 16-day fall meet began September 6th. In 1918, the Millar Law was passed, declaring taxes due every 14 days. The strict law thus limited the length of race meets to a two-week time frame. E.P. Taylor played a major role in the development of the Fort Erie Race Track. He developed the Canadian Triple Crown of Racing in 1959, with the second leg of the series, the Prince of Wales Stakes, being the Fort's featured race each season. Canadian thoroughbred racing is now recognized internationally, thanks in large part to the efforts of this one man. Widely regarded as the undisputed "King of Canadian racing", Northern Dancer's brief but storied career was launched with his maiden victory at Fort Erie Race Track. Race three on Friday, August 2, 1963, saw the beginning of Northern Dancer's impressive rookie season. Beating seven 2-year-olds for a purse of $2,100, Northern Dancer tipped his handlers to get ready for a fun ride. As a 2-year-old, the Canadian-bred colt won seven of his nine starts including the Summer Stakes at the Fort, earning over $90,000. Dance Smartly's career began with two straight victories but the string was snapped with a second in the 1990 Ontario Debutante Stakes at Fort Erie. In 1991, Dance Smartly went undefeated. Her campaign began at Woodbine in May with a victory in the Starshoot Stakes followed by a score in the Selene Stakes. With Pat Day in the irons, Dance Smartly whipped fillies in the Canadian Oaks, then romped to an eight length win in the Queen's Plate defeating the best three-year-olds in the country. Flawless performances in the Prince of Wales and the Breeders' Stakes earned her the Canadian Triple Crown trophy. She was the first filly in history to sweep all three races. After dancing away form the competitors in the Molson Million, the "Queen" was off to Churchill Downs and completed a perfect season by winning the Breeders' Cup Distaff. Her accomplishments earned her Sovereign Awards as top Canadian 3-year-old filly and Horse of the Year, plus an Eclipse Award as North America's best 3-year-old filly. Fort Erie Race Track's centrepiece is its beautiful infield, filled with flowers and scenic lakes. In 1961, a horse named Puss n Boots couldn't resist the plush surroundings and decided to take a detour and a refreshing dip while leading a race at the top of the stretch. Jockey Ronnie Behrens was sent flying as Puss n Boots veered inward and made his way to the infield. It sounds like a tall tale, but 14,106 fans were on hand that afternoon to testify that Puss n Boots did indeed take that fabled plunge into Fort Erie Racing lore. 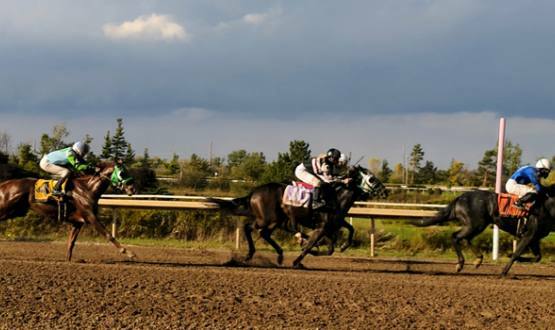 In honour of his impromptu swim, Fort Erie Race Track holds the Puss n Boots Stakes on the turf every summer. In 1996, the tradition continued with an eccentric twist. Prior to the event, owner Robert Elkins boasted that he'd follow Puss n Boots' lead and would jump into the infield lake if his horse, Dancing for Beans, won the race. Rider Francine Villeneuve must have been inspired by Elkins' dare, as she brought Dancing for Beans from last to first, sending Elkins for a swim. As the 133rd running of the Queen's Plate neared in the summer of 1992, Kinghaven Farms' Alydeed was made the early favourite at 1-5. The grey son of Shadeed had just missed winning the Preakness Stakes and was a runaway winner of both the Marine Stakes and Plate Trial. Alydeed was the shortest early morning favourite since Northern Dancer came off his victory in the Kentucky Derby. Indeed, Alydeed romped in the Plate, winning off by 11-1/2 lengths. The Triple Crown and the Bank of Montreal's million-dollar bonus appeared to be locked up. It was a simple process; win the Prince of Wales and Breeders' Stakes. Kinghaven would have a third Triple Crown. When Aydeed arrived at Fort Erie, who would have thought he would be involved in the biggest upset in the history of the Prince of Wales Stakes. Three days of rain had rendered the track deep and wet. On race day, another downpour left the track surface a muddy mess. Benburb, third in the Plate, was one of five who showed up to take on the 1-20 favourite. Benburb, with jockey Larry Attard aboard, stalked Alydeed's early pace and in a thrilling stretch duel, nailed him at the wire. Benburb destroyed the dream of a Triple Crown in '92 and voided the million-dollar cheque. Those wise enough to wager on Benburb that rainy Sunday afternoon were rewarded with a $51 win mutuel. It wasn't the biggest payoff in Prince of Wales history, but provided the most surprising outcome by far.